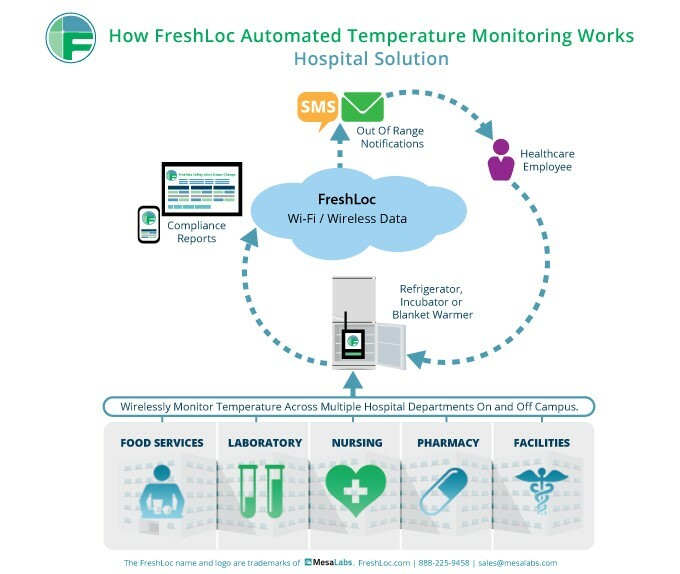 FreshLoc’s temperature monitoring of refrigerators, freezers, and warmers is vital to ensure patient safety, as well as to remain compliant with medication management standards and reduce potentially costly product loss. One-third of hospitals receive noncompliant scores when surveyed on the Joint Commission’s MM.03.01.01-Medication Storage standards, a significant statistic when one considers the potential patient risks and facility expense at stake. Manually recording refrigeration temperatures on paper has the potential for being missed and is usually done only once or twice a day. Easily and cost effectively alleviate this hassle with FreshLoc’s wireless temperature monitoring system. Moving away from manual temperature monitoring to FreshLoc gives healthcare professionals a customizable solution, allowing the user to monitor and document a range of information such as temperature, pressure, humidity, and other important measures, depending on the sensors installed. Upon logging in, the user can view refrigerator groups and their current status, obtaining a snapshot of which refrigerators are in and out of range. The system displays graphs of data points collected over a selected period of time (eg, the previous week or month) on any of the units selected, and these time periods can be adjusted as needed. The system also can generate a variety of useful reports on any or all of the units, display an example of the report before printing or exporting, and provide alerts such as low battery warnings to prevent transmission interruptions. Alert notifications are also customizable; the user can set the parameters and designate the alert method to be used. FreshLoc’s system can record temperatures at configurable intervals (eg, 2 or 15 minutes) to ensure that medications are stored at the appropriate temperature and that the equipment is working properly. This feature is useful in maintaining regulatory compliance, especially when clinics are closed and staff members are not available to check and record the unit temperatures consistently. Considering the average value of medications in hospital refrigerators, the use of FreshLoc’s system can serve as insurance against costly medication loss due to mechanical failure. While a thermometer can display whether a unit was out of range according to the parameters set, it cannot indicate the length of time the unit was out of range, as FreshLoc’s system can. Although some products can exceed the labeled storage temperature requirements for a brief period, the length of time the unit has been out of range is unknown; thus, the product must be destroyed. With a FreshLoc system, considerable financial waste is prevented. And with wireless technology, transmitting information using Wi-Fi allows facilities to add and move units as needed, thereby avoiding the expense and inconvenience of structural changes. Finally, the valuable information gleaned from a FreshLoc system not only helps to identify low-performing refrigeration, freezer, and warmer units when considering equipment replacement, but also provides additional justification for upgrading from nonmedical-grade refrigerators to medical-grade units, consequently improving medication safety and patient care. Schedule a personal demo of the FreshLoc system today!